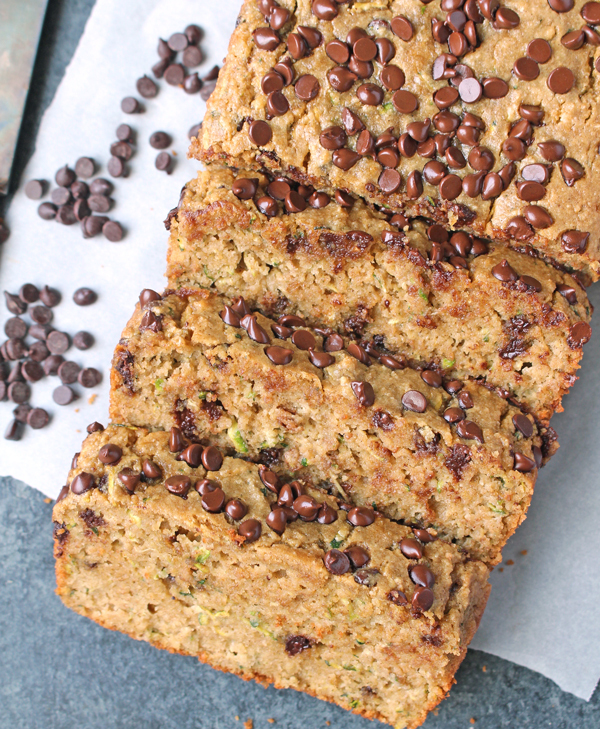 This Paleo Chocolate Chip Zucchini Bread is so moist, packed with chocolate chips and easy to make! 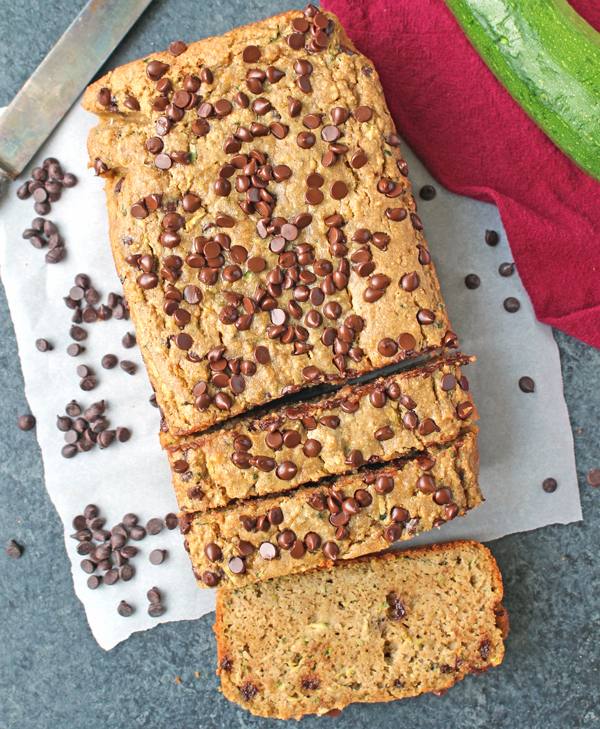 Gluten free, dairy free, and naturally sweetened- a healthier version that everyone will love! This bread is super easy to make. Shredding the zucchini is what takes the longest and even that is quick. Everything is mixed in one bowl, making clean up super easy. 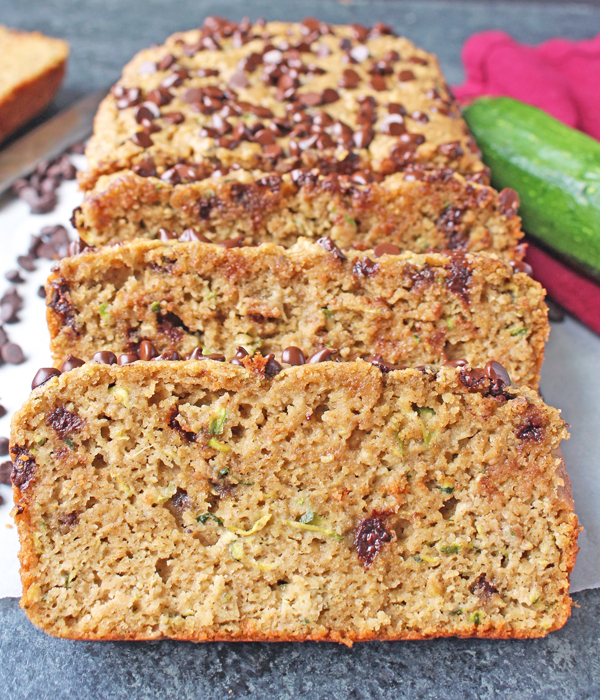 The combination of almond and tapioca flour gives this bread the best texture. 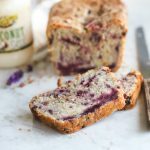 It’s moist and soft, not spongey like some paleo baked goods. I measured the zucchini in cups, not number of zucchinis because the size can vary so much. I’ve seen them super little and ones almost as big as my arm. It should take about 2 medium zucchinis, but if you have some in your garden or from the farmers market that are on the larger side, it will probably only take 1. Speaking of zucchini- I never peel mine because the skin is so soft you can’t taste it or notice it. It does have a few green specks throughout the bread though and if you’re baking for picky eaters you may want to peel them to make it less noticeable. 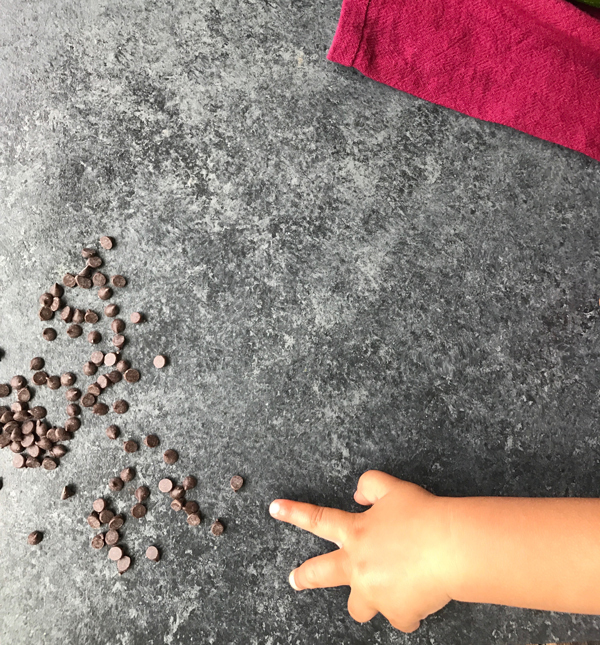 My daughter thought I put those chocolate chips out just for her! 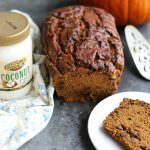 This bread is naturally sweetened with coconut sugar. 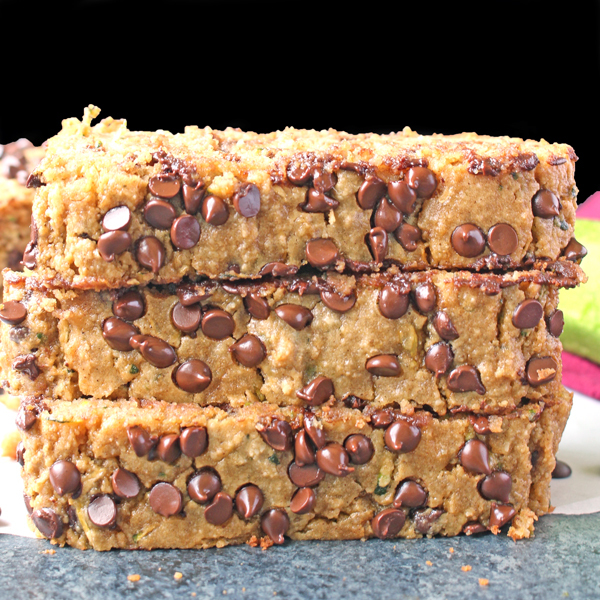 It’s not overly sweet and is balanced perfectly with the chocolate chips. 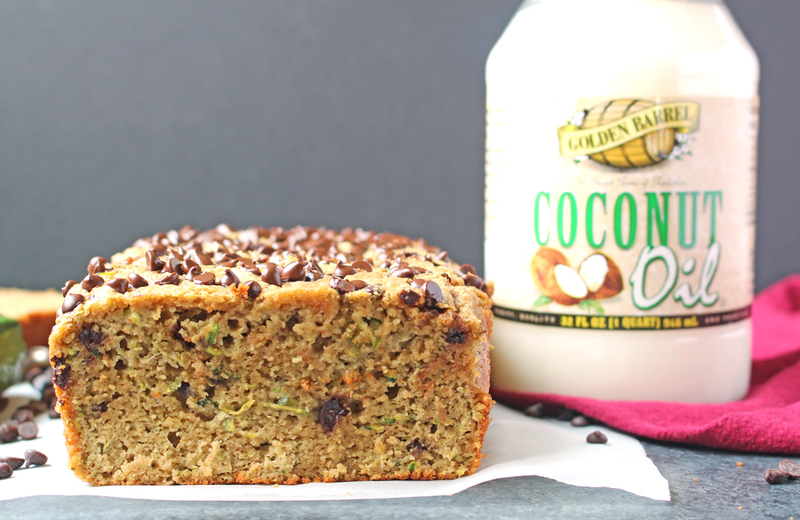 Using Golden Barrel Coconut Oil in place of butter keeps it dairy free. 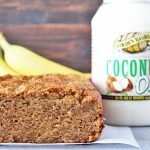 It makes a great snack or even breakfast. 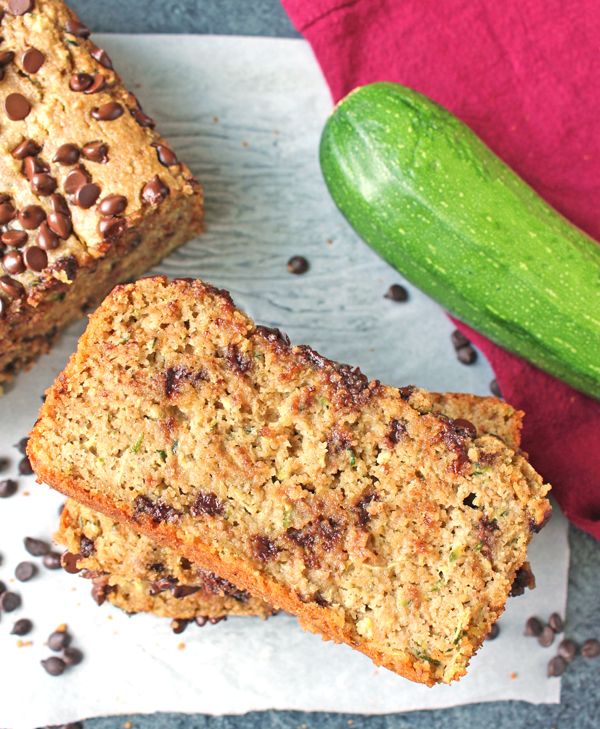 This zucchini bread is one of my favorite treats and I think you’ll love it as well! 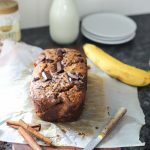 Super easy to make and so delicious! Preheat oven to 325° and line a 9x5 loaf pan with parchment paper. Set aside. Place the zucchini in a medium bowl (the bowl you shredded into) and press it gently with a paper towel to remove excess moisture. It doesn't need to be squeezed hard, just a little moisture needs to be removed. In a large bowl, combine almond flour, tapioca flour, coconut sugar, salt, cinnamon, and baking powder. Stir well. Add in the coconut oil, eggs, and vanilla and mix until incorporated. Fold in the shredded zucchini until evenly mixed. Add in the chocolate chips, stir, and pour into the prepared pan. 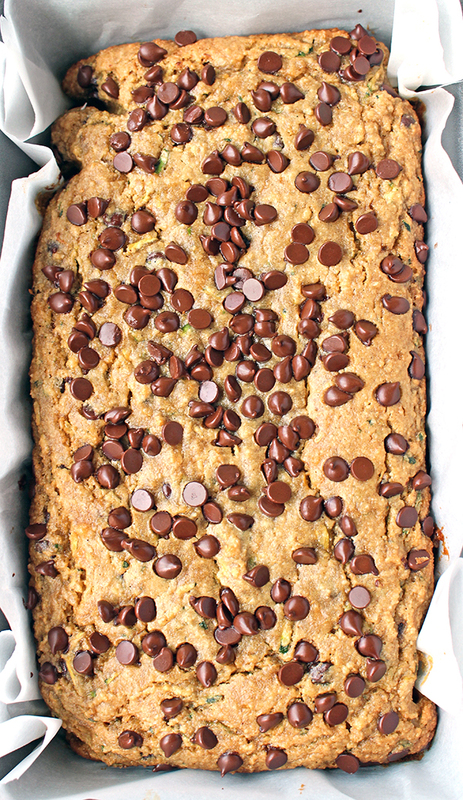 Top with additional chocolate chips and bake for 50-53 minutes. Top should be golden brown and a toothpick inserted in the center should come out clean. Enjoy right away or at room temperature. All leftovers are best kept in the fridge. Mine took way longer to cook than listed. The recipe says to cook on 325, is that correct?? It also had a gritty texture. Not sure what I may have done wrong. HI Martha- yes, that is the correct temperature. It definitely should not be gritty. Did you substitute any ingredients? I’m sorry it took so long for yours to bake. I hope you still enjoyed it. This looks amazing. 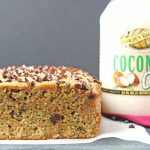 Can you substitute some of the almond flour with some coconut flour? Hi Kate- sorry it took so long to reply! That may work, but I don’t know exact measurements and would hate to see you waste ingredients. Coconut flour is very dry so you wouldn’t need as much, but like I said, I don’t know the amounts. I’m sorry!